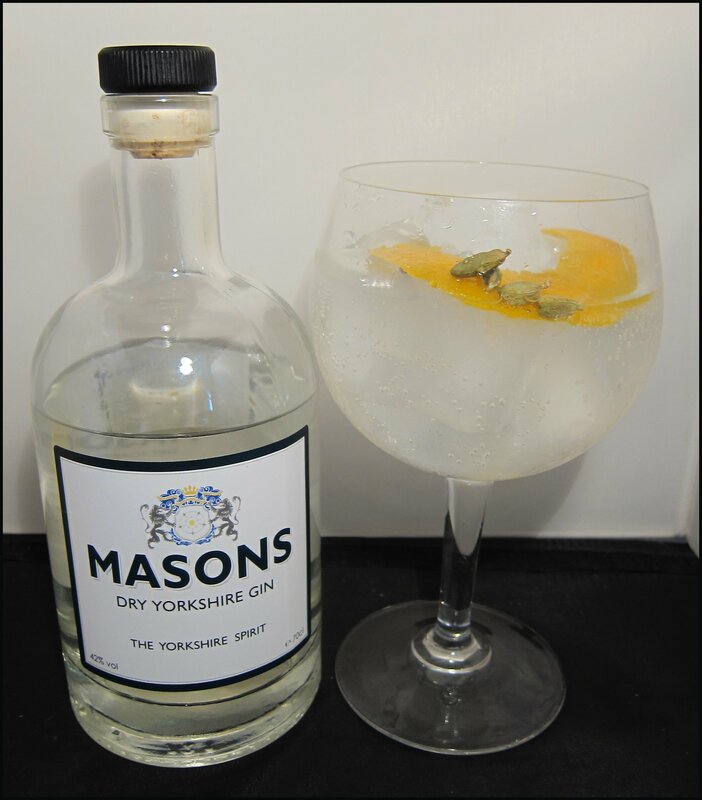 Today is World Gin Day and so it’s fitting that today is the day that Masons Yorkshire Dry Gin is launched to the world. 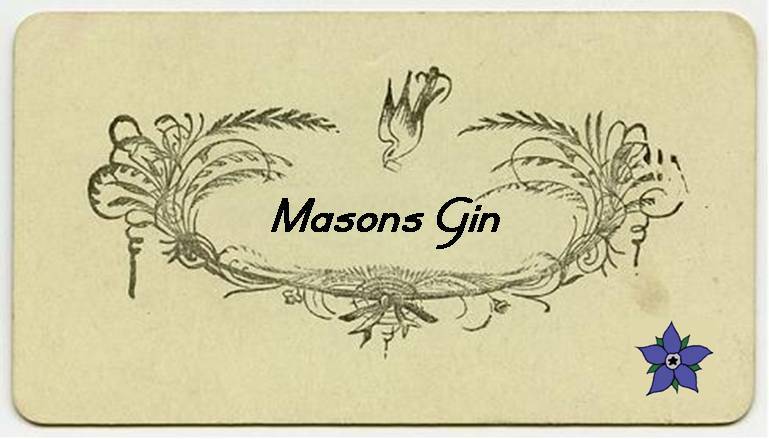 Masons Gin is based near Ripon in Yorkshire* and uses water from the local Harrogate Spring to cut the distillate ready for bottling, which is done at 42.0% ABV. Nose: Fennel and coriander, as well as a little leafy lemon. Taste: A smooth spirit with some malty, grain notes reminiscent of gin made with a white whiskey base. This is followed by coriander mixed with some piney elements alongside some juniper. The flavour then moves onto some herbal notes such as fennel, liquorice and caraway; this combination of flavours both adds a little sweetness and gives the gin a long, lingering finish. Excellent – full of flavour, with some malty notes and the juniper, it is very rounded and comforting, almost “cuddly”. Then, you get some great fennel and liquorice on the finish. This is definitely something different. My suggested serve for this would be to use plenty of ice and a nice wedge of fresh lemon. This is a Gin Tonic as Served at Shepheard’s in Cairo in April 1938. Take a rickey glass, rub the inside with the peel of a lime. 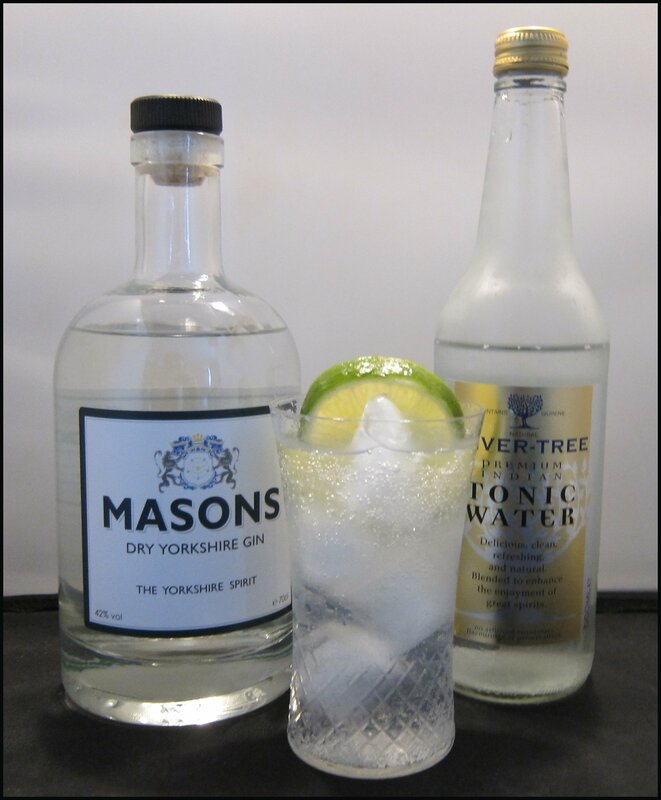 Pour in a jigger (35ml) of Masons Yorkshire Dry Gin, add ice cubes, a slice of lime or lemon, and fill with Fevertree Indian Tonic Water. The drink allows the gin to come through especially the anise/fennel/liquorice giving it a slightly sweet start. This is then balanced out by the juniper and coriander as well as the lime peel and ganrish. As the ice melts and the drink get a little cold it improves even more. Very refreshing and a nice dry crisp finish. 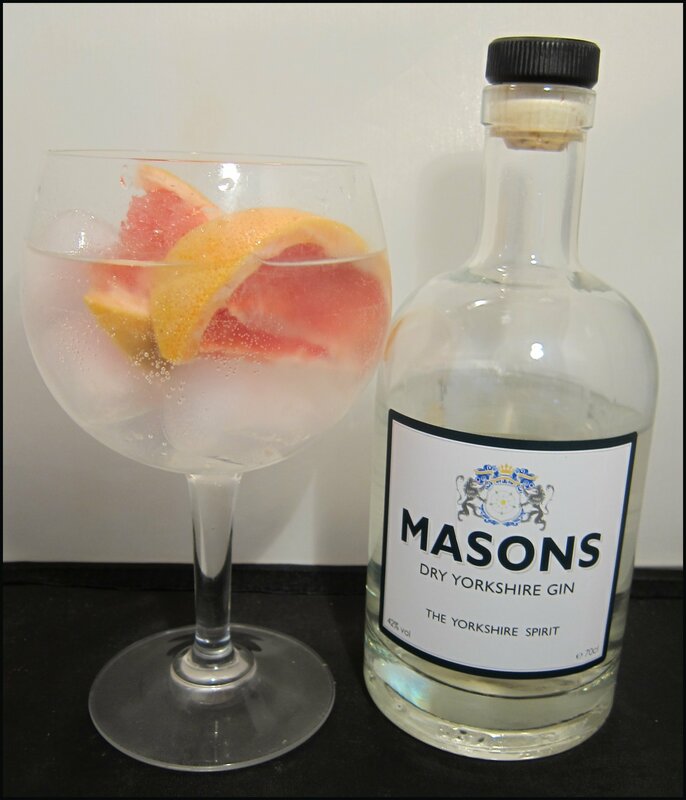 Overall @YorkshireGin makes a tasty GT but it is not your usual fair, good for those seeking something less pedestrian. Good stuff 1938 AD. 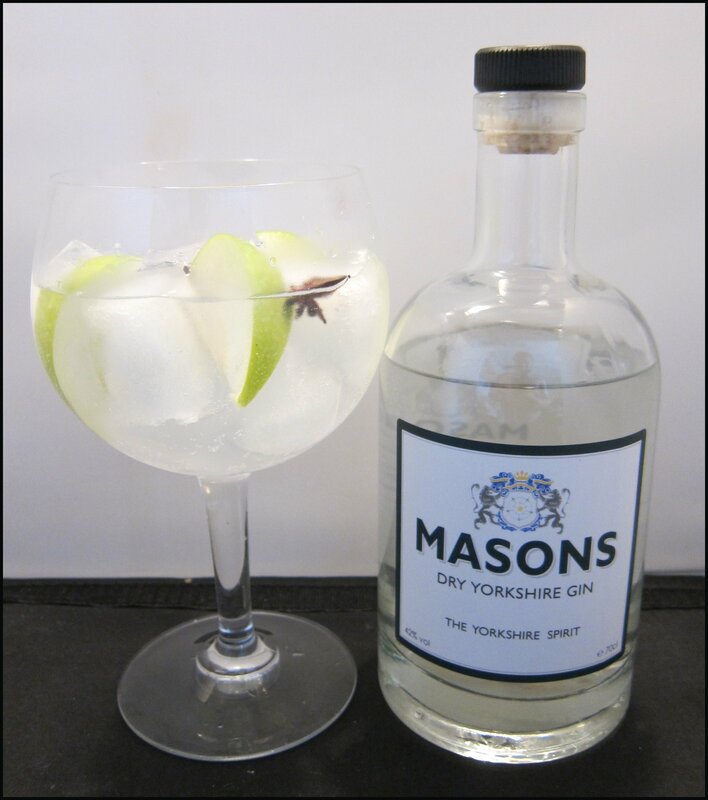 Tasty stuff, with the crispness of the apple and the anise bringing out the fennel and liquorice notes of the gin. Fresh and crisp and, for extra bite, you can munch on the tangy apple. A fine Gin Tonica for a lazy Saturday afternoon; lively, but not too intense and relatively light. If you want a fragrant Gin & Tonic, then this is superb. I really like how the orange complements the flavours of the gin and the spice of the cardamom works well with the fennel/liquorice notes of the gin. This is superb, vibrant and refreshing. A simple, but very effective garnish, with the rich, zesty citrus juiciness working well with the character of the gin. Crisp and refreshing. As lovely as all of these drinks are, how can you test a gin without trying it in these two classics? A good, solid drink with juniper, citrus and some malty, grainy notes, coriander and the some sweet fennel notes, too. There’s a long glow of flavour with a little warmth on the finish. Bold and classic with a slightly contemporary edge, but plenty to keep you interested as you drink, and wanting another. This is another good drink: the fennel/anise/caraway notes work well with the Campari and vermouth, almost giving the drink an impression of an absinthe rinse around the glass. It has a good bitter-sweet balance, with a full flavour, rich texture and lasting finish. *It is currently actually made under contract in Cambridgeshire by the English Spirit Company, but that is only whilst the Yorkshire distillery is being built.